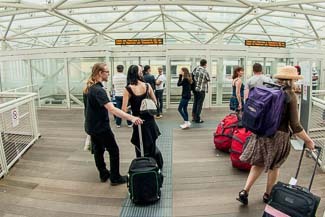 ABOVE: Cruise passengers wait for a People Mover tram at Piazzale Roma. Marittima is used by all large ships (and, sometimes, by smaller ships), while the satellite terminal of San Basilio and its adjacent pier of Santa Marta are used by small- to medium-sized ships, river vessels, and hydrofoil ferries to Croatia. If you're arriving or departing at Marittima, you have plenty of options. A People Mover automated tram runs between the Marittima cruise basin and Piazzale Roma, and airport boats of Alilaguna's Linea Blu stop at many locations in the districts of Dorsoduro, San Marco, and Castello. Click here for walking directions to hotels near Piazzale Roma, or see our Venice Cruise Terminal Hotels article for hotel recommendations in other areas that are served by Alilaguna Blue Line airport boats.